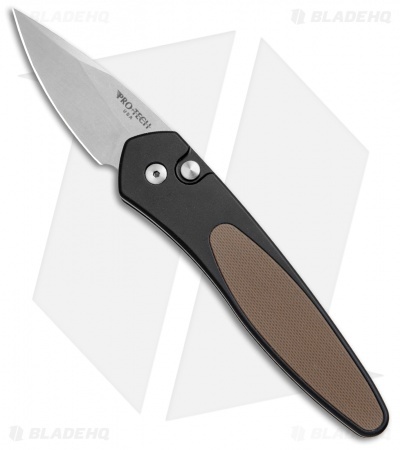 The Half-Breed automatic knife from Protech features the larger handle design of the Newport and the CA legal blade of the Sprint knife. This Half-Breed knife has a stonewash finished S35-VN steel blade and a black anodized aluminum handle with a brown G-10 inlay and a black tip-up carry pocket clip. Love the full handle size with the small blade. It does simple everyday tasks with ease without scaring the sheeple and looks amazing with the brown g10 inlay (which has a pretty grippy texture) and satin blade. Super smooth and snappy action on it. I thought my Kershaw Launch 4 was fast, this thing flies open! 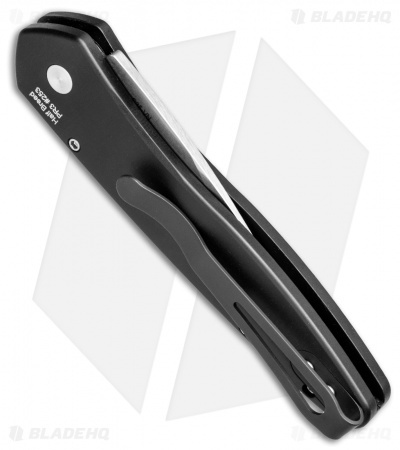 -Small blade with a nice sized handle. -Looks great! 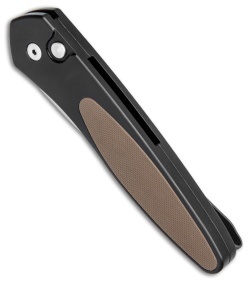 You could almost even consider it a "gentleman's auto"
-Very deep pocket clip, it just disappears. -Hair shaving sharp out of the box. -Wish they would have used torx screws instead of Allen screws. Thank you Protech for this gem.